Description on the box of NETGEAR WNDR3800 we feature for review today says that the device possesses a kind of 'premium' functionality. We are not really planning to find out how premium its functionality is, but we will try to provide you with the most detailed insight on it and test its performance. Let's get started! 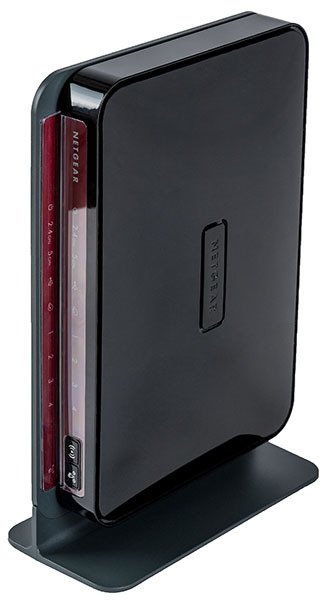 NETGEAR WNDR3800 wireless router comes in a plastic case which consists of two parts. The dominant colours are black, dark grey, and maroon. The upper panel of the device is glazed, whilst the bottom one is opaque. Unfortunately, we can't help but mention that the glazed plastic the case is made of may be easily scratched so that under certain illumination one can see all scratches. The model under review can be placed on a table horizontally or vertically, or mounted on a wall. A single-purpose support stand that is used for vertical placement of the device on the table comes in the box. To work properly WNDR3800 needs an external power unit with the following characteristics: 12 V and 2,5 А. The upper panel (when the device is mounted horizontally) has a 3D brand tag. Side panels are not remarkable at all. The front panel has LEDs indicating the device status, as well those of its wired ports and wireless modules, and two buttons: one ON/OFF button for Wi-Fi and the other one for facilitating the wireless user connection procedure (WPS). 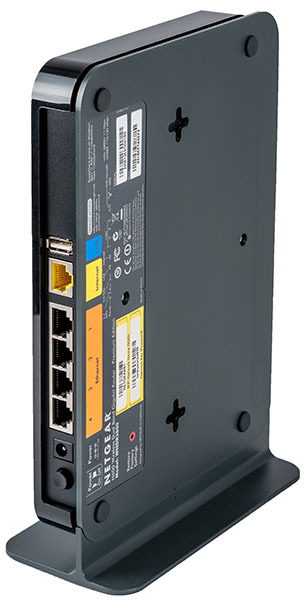 On the rear side there are five Gigabit Ethernet ports (one of them is WAN and the rest are LAN), USB 2.0 port, and a power socket with ON/OFF button. The bottom side has four rubber legs used for table mounting and two tooling holes used to mount the device on the wall. Also, a sticker with brief information about the device can be found over here. Sunken Reset button used to reset the user settings is located on this panel too. The hardware platform of the model under review is one green textolite card where elements are located on either side. Two tiny additional cards perform functions of antennae. 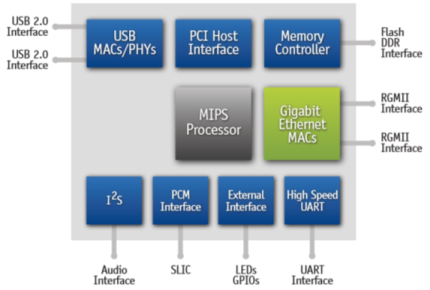 NETGEAR WNDR3800 wireless router is powered by a MIPS Atheros AR7161 CPU, and its flow chart is presented below. Realtek RTL8366SR chip serves as a wired GE switch. Two Hynix H5DU5162ETR-E3C modules, with the size of 64 Mbytes each, act as the device RAM, making the total RAM of WNDR3800 128 Mbytes. 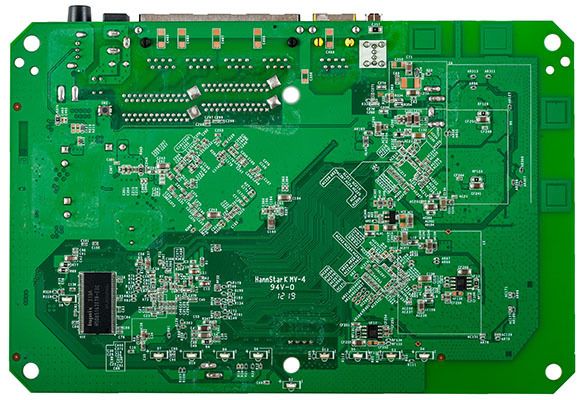 That is where we bring the review of the device hardware platform to a conclusion: all other components are covered with a metal screen and are inaccessible for review. 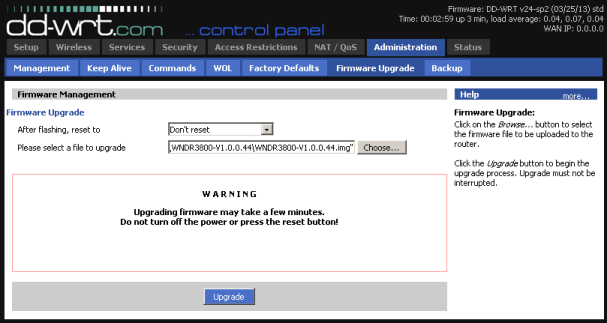 Firmware upgrade is carried out in Firmware Update group, Administration menu item of the web-interface advanced mode. Firmware upgrade may be carried out both in a manual and semi-automatic mode. In case of the latter the router gets connected to the vendor's server and checks for a newer firmware all by itself. In order to upgrade the firmware manually a user will need to download the firmware upgrade file and then upload it to the device. The whole firmware upgrade process takes about three minutes and does not require any technical proficiency from an administrator. 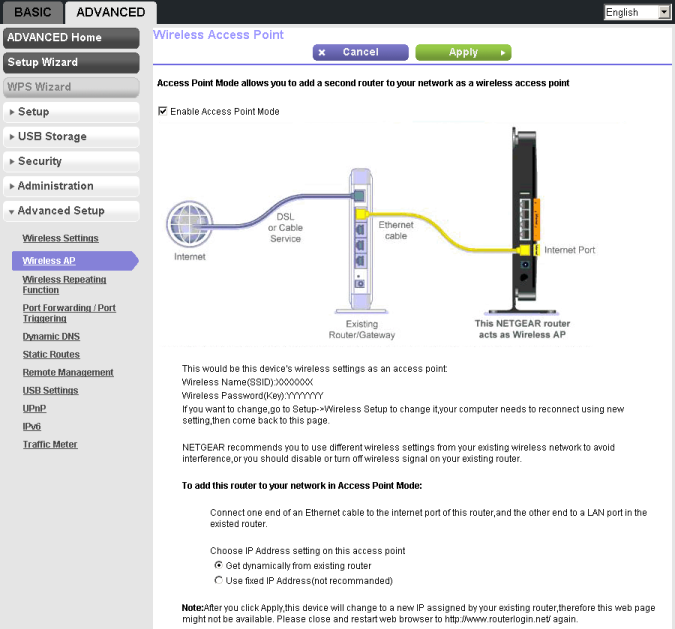 It would be fair to notice that there are alternative firmwares, for example DD-WRT, that may be used with NETGEAR WNDR3800. 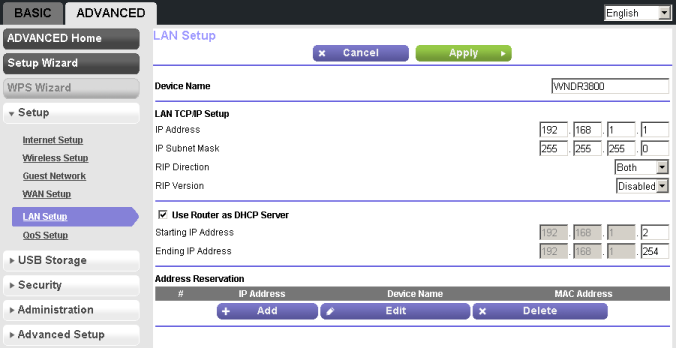 DD-WRT firmware is installed in two steps. The user needs to upload the initiate image to the device and then the firmware will be updated automatically. The firmware upgrade process is reviewed in detail on the website of the developers of the alternative firmware. 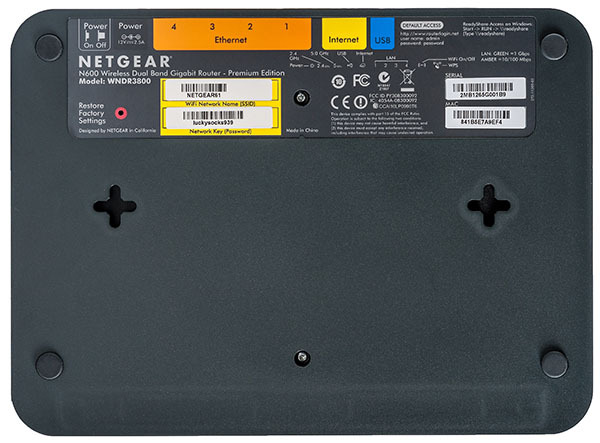 However, it's worth noticing that we could not change to DD-WRT using 1.0.0.44 firmware by NETGEAR and we had to install an older version, 1.0.0.16, as v24-sp2 (03/25/13) firmware incorrectly identified the router we used as WNDR3700 v2. The user can change to the official firmware by uploading the applicable firmware in Firmware Upgrade group, Administration menu item, basic mode. The method we just mentioned didn't work for us and we could not change to the factory firmware. Instead of it we had to change the router to the recovery mode (it's on when Power indicator is flashing and you can change to it by pushing Reset button for several seconds while the device is booting) to transfer the firmware through TFTP. It's worth noticing that this method of firmware recovery will also come in handy if a failure during the upgrade process took place upon usage of the official firmware. 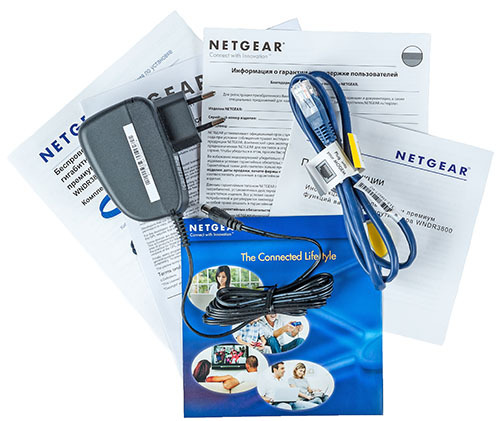 The user can also use the vendor's website to download software used for facilitation of the installation of a data carrier as an HDD or a printer connected to the device USB-port. Now let's pass on to a brief review of the web-interface capabilities of the device. 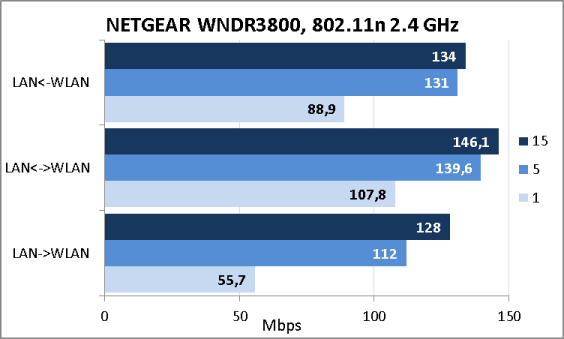 We decided not to review all capabilities of the web-interface of NETGEAR WNDR3800 in detail in this review since they are quite similar to the ones we have already seen in WNDR4500 and R6300. 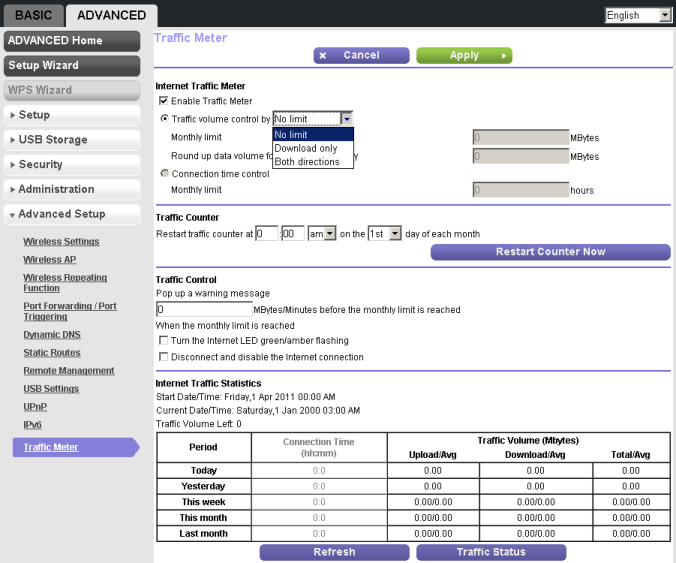 The device web-interface is available in 22 languages and operates in one of the two modes: basic and advanced. 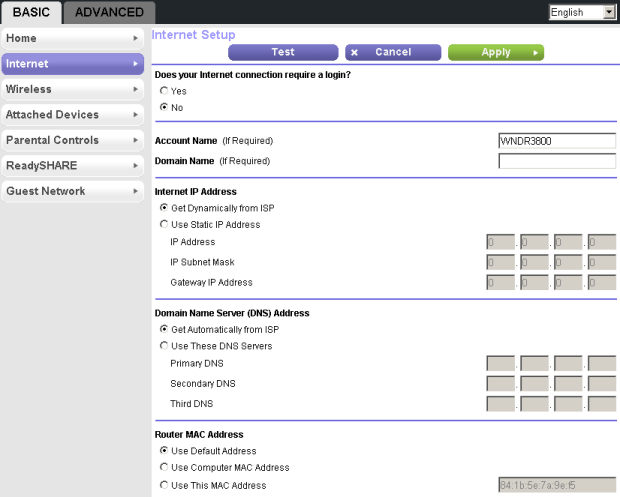 Basic mode allows the user performing the primary tasks such as reviewing the router status, managing WAN connection parameters and wireless module settings, and granting access to an external data carrier connected to the device USB-port. 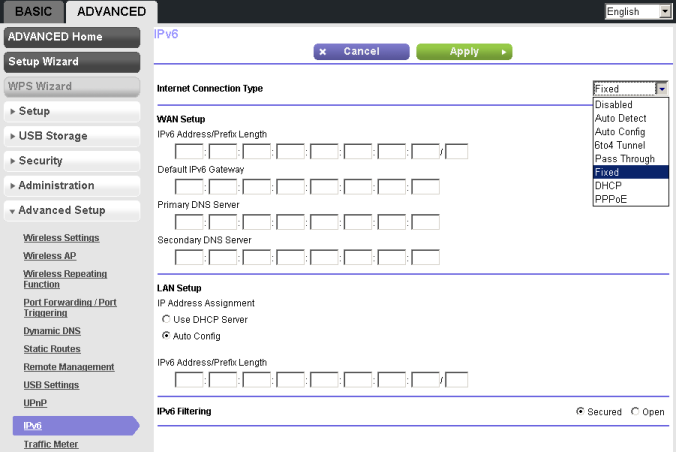 Advanced operation mode of the web-interface allows the user to manage settings of wired and wireless network segments, as well as those of connection to the Internet, more accurately. The above-mentioned settings are located in Setup menu item. Groups in USB Storage menu item are used to manage operation of a flash card. By using Security menu item the user can limit the list of websites that may be accessed and manage access to various services and utilities. Groups in Administration menu item are used to review logs, manage user settings, and upgrade firmware. 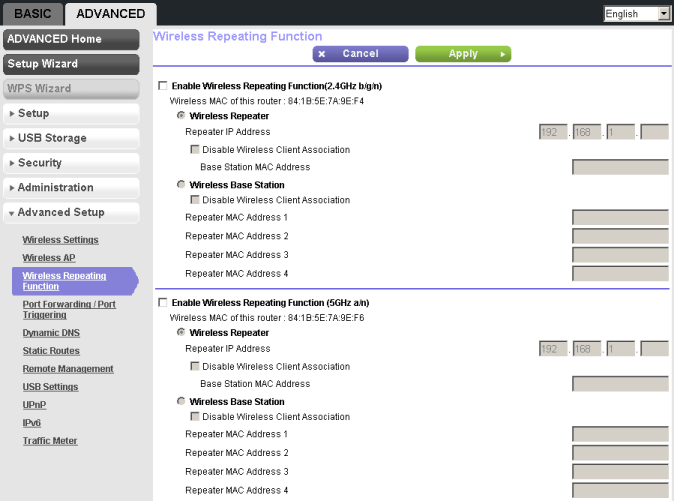 Wireless Settings, Wireless AP, and Wireless Repeating Station groups in Advanced Setup menu item allow the user to manage the wireless module very accurately and select its operation mode. 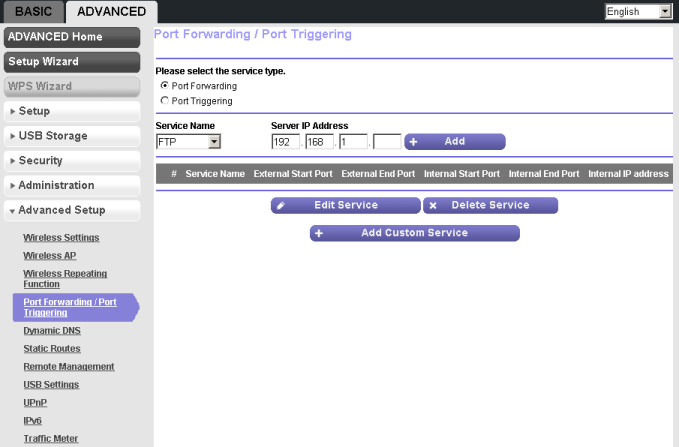 All other groups in this menu item are used to manage DDNS, port forwarding, static routing, USB-port, maintain support of IPv6, and estimate the user traffic count. 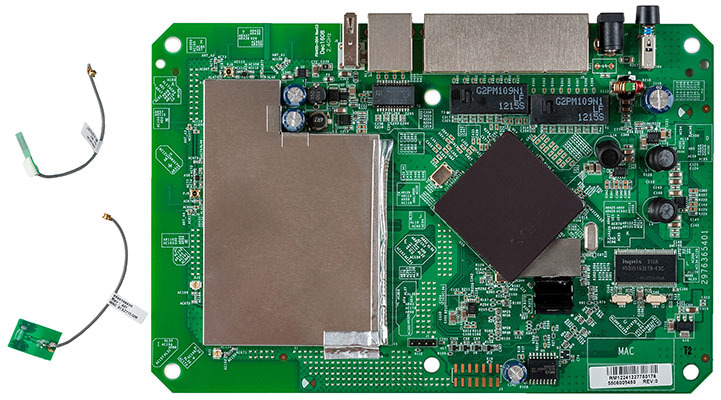 That is where we bring a brief review of NETGEAR WNDR3800 router web-interface to a conclusion and pass on to examining capabilities of its command line. Access to the router command line is prohibited by default. 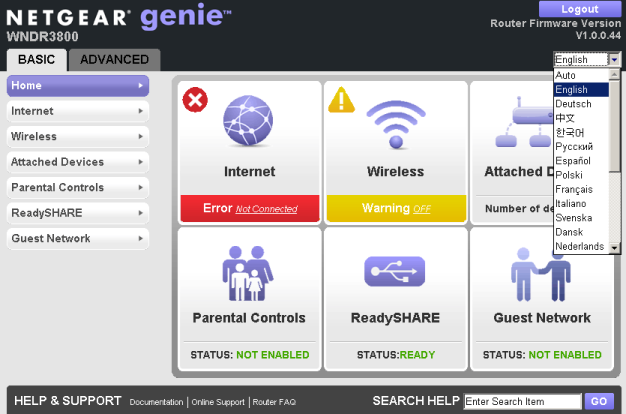 One can access it using a standard utility for NETGEAR devices called telnetenable. The only thing we would like to point out is absence of a password upon connection via telnet. BusyBox 1.4.2 library is installed in Linux 2.6.15. Copyright (C) 1998-2006   Erik Andersen, Rob Landley, and others. Licensed under GPLv2. See source distribution for full notice. Let's see what processes are currently running via ps command. That is where we bring review of the device command line to a conclusion and pass directly on to testing it. The first testing procedure we usually begin our testing section with is estimating the booting time of the device, which is a time interval starting with the moment when the power is on until the first echo reply is received through ICMP. WNDR3800 starts sending the first echo-replies in 20 seconds after booting. However, we think that the booting procedure takes more time since the device becomes unavailable after sending several first replies. 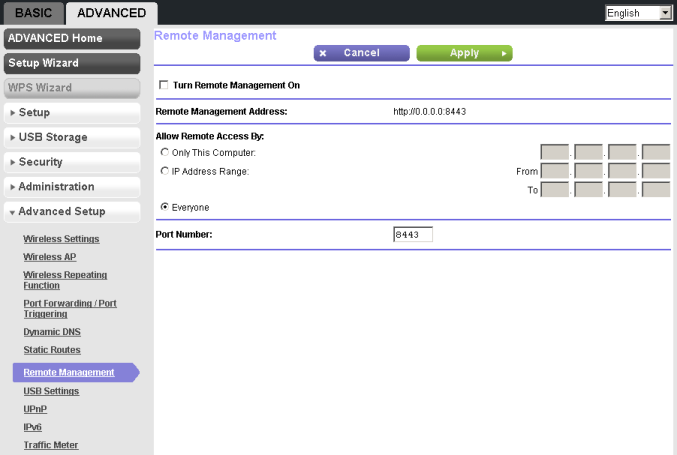 This way we can assume that the booting time of NETGEAR WNDR3800 amounts to 50 seconds. We believe that this result is decent. The second test we traditionally performed was a security scanning procedure which has been carried out using Positive Technologies XSpider 7.7 (Demo build 3100) utility. On the whole, there were eleven open ports discovered, and they are TCP-23 (Telnet), TCP-53 (DNS), UDP-53 (DNS), TCP-80 (HTTP), TCP-548 (afpovertcp), TCP-3333 (dec-notes), TCP-5555 (HTTP), TCP-20005 (unknown), TCP-33344 (unknown), TCP-49152 (HTTP), and TCP-49153 (HTTP). The most interesting data are presented below. Prior to carrying out performance tests we can't help to mention the key specifications of the test stand we used. 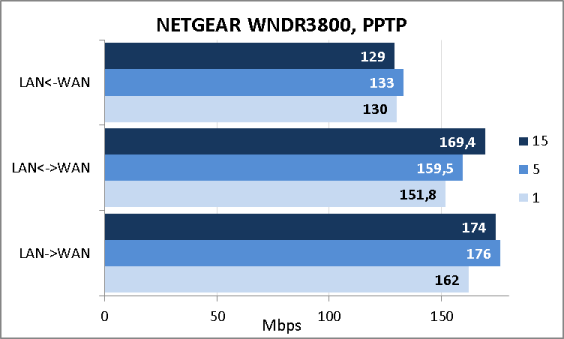 At first we decided to test WNDR3800 IPv4 routing performance using NAT/PAT translation, as well as without using this feature, for 1, 5, and 15 concurrent TCP-sessions. 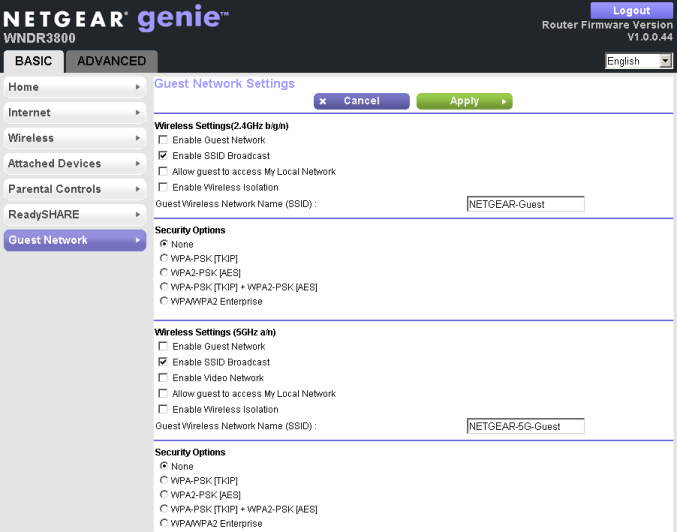 Also, NETGEAR WNDR3800 supports IPv6. 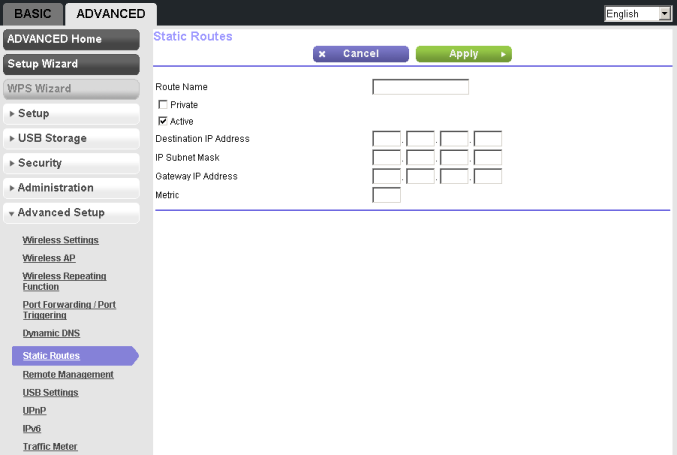 We couldn't help but test the routing performance using this IP. 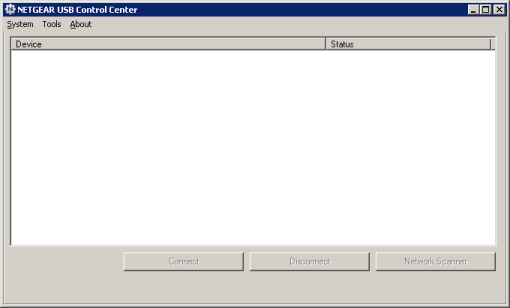 Connections from the external network to the internal are prohibited. 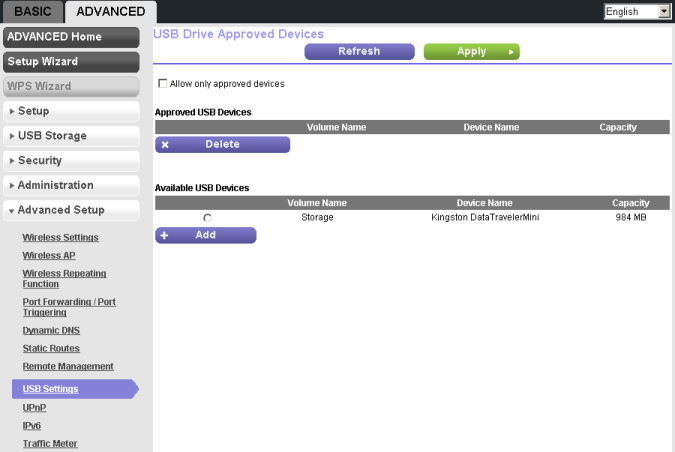 We connected a 750 Gbyte Transcend StoreJet 25M3 hard drive to the device USB 2.0 port, and formatted it into three file systems: NTFS, FAT32, and EXT3. 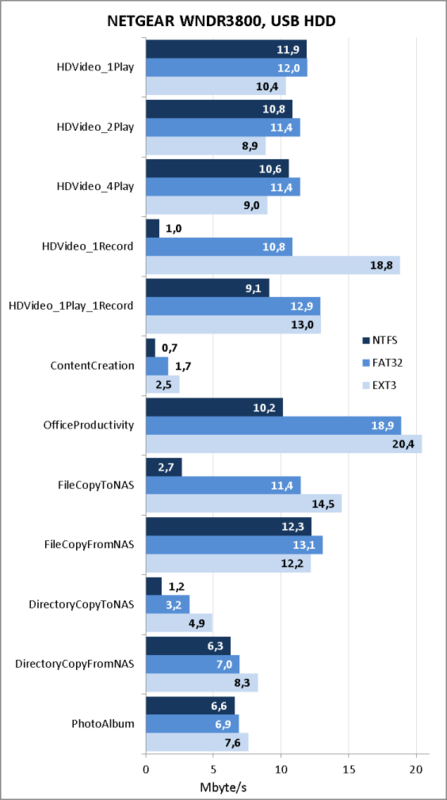 Measurements of data access speed were carried out using Intel NASPT 1.7.1 utility. Results of the measurements are presented below. Neither did we keep away from performance tests of the wireless network segment of the device. 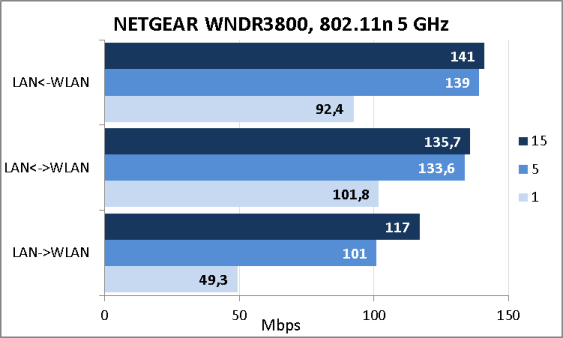 NETGEAR WNDR3800 supports simultaneous operation under two wireless frequency ranges: 2.4 GHz and 5GHz. For majority of Russia's citizens the thing that really matters when buying a good router is the device performance margin upon operation with PPTP tunnels. The data transmission speeds via PPTP without encryption are presented on the diagram below. Unfortunately, WNDR3800 does not support encrypted tunnelling. 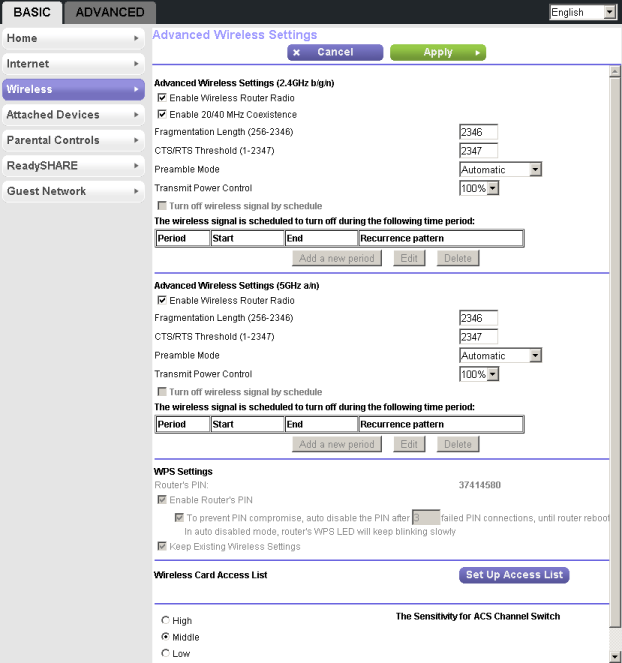 Generally, we are quite glad about the wireless router we have tested; some of its strength areas are specified below. 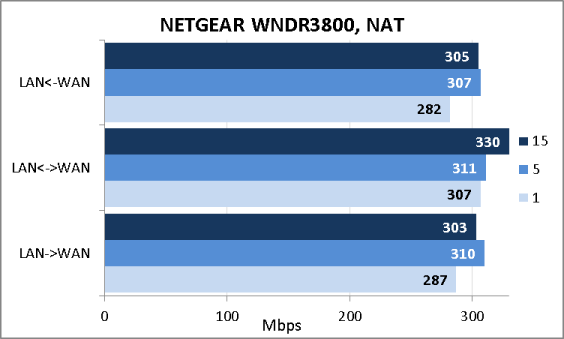 NETGEAR WNDR3800 went on sale about two years ago and the final users had enough time (from the telecommunications point of view) to test its firmware, so at the moment it is really stable and well-tuned. 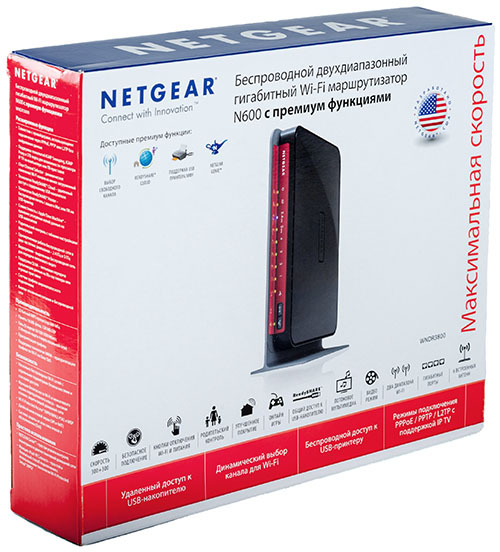 As of when this article was being written, the average price for NETGEAR WNDR3800 in Moscow online shops was 5000 roubles.